Madoca has been a slave for Uunguist and his family for longer than she would care to remember. Annoc, Uunguist’s daughter, is particularly cruel to Madoca, and ensures that any free spirit Madoca displays is quickly punished. Despite her brutal life, Madoca remains impassioned by the Dragons and the Dragon Seers that advise and respectfully govern the chieftains. With the selection of a new Dragon Seer drawing near, Annoc is convinced that she will be the new Seer, and Madoca wishes for Annoc to earn the honour as well, if only to keep Annoc away. However, Madoca’s life changes when the Dragon, Heather, selects Madoca over Annoc to be the new Dragon Seer. Madoca and her longtime friend Garit are taken from Uunguist to begin their new lives. In Pitdragon, Madoca learns how to become a Dragon Seer from Lichen, the eldest of the Dragons, as well as Eenna and Nechtan, the two other Dragon Seers. The training is difficult and Madoca discovers she is running out of time to learn, as she discovers that the survival of the Dragons is in jeopardy, and she is the one destined to save them. 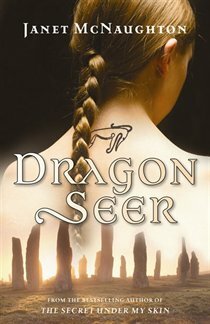 Dragon Seer is a young adult fantasy novel told from a third-person, immediate-engaging perspective. "At first, she flew just for joy while the crowd oohed and aahed. Then, the dragon became more thoughtful. Suddenly, she flew across the fire and hovered over Uunguist’s household. Annoc shone, brilliant in the dim light. I hope, Madoca thought. But the dragon hesitated, as if listening. For one heart-piercing moment, Madoca was rent with grief. Me, she thought, let it be me" (9). "That night, Madoca drifted off to sleep with the image of the longboat behind her eyes, black against the setting sun. She thrashed and tossed her blankets to the floor. Near dawn, she dreamed of three strange men dressed in furs and metal helmets. One hit the symbol stone with his battle-axe, breaking it into three pieces. The men laughed as they threw the pieces over the cliff, onto the beach below. She could feel the wind on her face, smell the plume of rock dust that rose from the shattered stone. Madoca woke breathing hard. A vision of the future or just a fear? She could not tell" (72-73).